Handweaving lets us slow down in a hectic world. We gather our ideas, choose our yarns, design our weave structure, and create a work of our own from start to finish. We have something to show (and share) from our time and effort, but more valuable is experiencing the process of design, creation, and fulfillment. In a world in which much of our work consists of repeating a small step over and over, we experience through our weaving a creation from thought to reality—a real accomplishment. We have so many wonderful looms available and so much luscious yarn. In a few quiet hours with Weaver’s Craft by our sides, we can immerse ourselves in the creation of something truly useful and beautiful. I began Weaver’s Craft to share information I told students over the years while they learned to weave in one of my classes. It’s a big challenge, but I’m enjoying it! As a former editor of Handwoven magazine, I put my skills to work to create a publication of my own, one designed for beginning and intermediate handweavers. I’m a one-person business, so I design, weave, photograph, draw, and lay out the publication before sending it to the printer. In Issue 30 published in the fall of 2013 I announced that I will no longer accept subscriptions or renewals. The last issue I am promising to publish is Issue 32. Back issues as well as new issues as they are published will continue to be available through this website or through retailers. 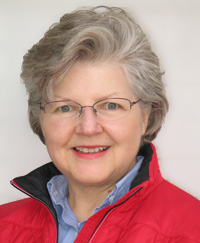 Thanks to all my students over many years—from classes at Oregon State University, Salem Art Association, Lewis and Clark College, Oregon College of Art and Craft, and lots of workshops across the country. I appreciate your inspiration, enthusiasm, and wonderful questions. May I weave the projects in Weaver's Craft and sell them in my guild's sale? Why doesn't Weaver's Craft show projects in black or other dark colors? Many of the projects in Weaver's Craft would look stunning in dark colors. The problem is that details of the weave structure don't show up in dark colors. In light or medium colors, on the other hand, the fabric texture and yarn intersections are easy to see. Often white is chosen as one of the colors, especially in the warp. Not only does it show every detail of the weave structure, but white is easy to see when threading the heddles and reed. For you own projects, I encourage you to choose your own colors, including all the wonderfully rich dark colors as well as black. Site contents © Plain Tabby Press. Design by RRM. 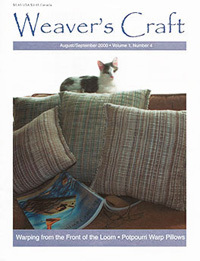 Site maintained by Plain Tabby Press ⁄ Weaver’s Craft.